Designed to serve in a variety of commercial and residential settings, this classic pole tent from Celina Tent is ideal for those seeking a sturdy and long-lasting product. The tough vinyl top is constructed with 16 oz blockout material, and 95% of the tent top is bonded with a heat-sealed construction that features 1" overlapped seams. 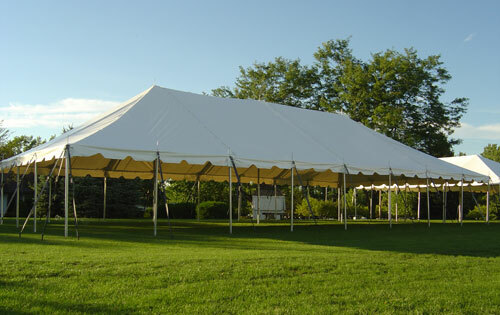 Additional strength is provided at the poles with 2" reinforced vinyl webbing, while the side curtain rope is firmly fastened in place with 1" polyester webbing that is sewn approximately every 15" around the tent. Scalloped valances with vinyl binding add to the appeal of the tent. This tent comes with a 7' aluminum pole kit, along with all of the required stakes and ratchets.